Each year, Laurent Haug and his team organize the main Lift event in Geneva at the CICG. This year Lift11 was a three day event gathering one thousand persons around the topic “what can the future do for you?”. Some people say that this conference is only for geeks (article in french in Marianne) and I do not agree with that. This conference is more than a simple tech event. Lift is a community of people. Concept: all the videos are publically available, this year live with livestream in collaboration with Thierry Weber and on-demand with Klewel. The first time participant session with testimonials from addicted Lifters. The Twitter democracy by Matthias Lüfkens who manages the online communication of the World Economic Forum. 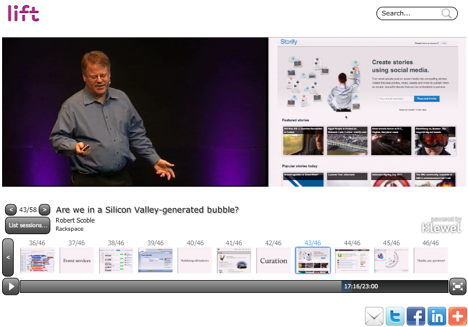 The Alp ICT venture night and start-up presentations with the conclusion by Robert Scoble, the famous american blogger who knows almost everything about emerging technologies and related companies (watch also his interesting Lift 2006 talk).